NORTHERN CAMBRIA, Pa. (AP) — Although he’s not yet 13 years old, Braden Moriconi has already overcome a lot in his life. Nearly 10 years ago, a 3-year-old Moriconi was outside playing when he slipped on some grass and fell under a lawnmower, an injury that required amputating part of his left leg and his left foot. 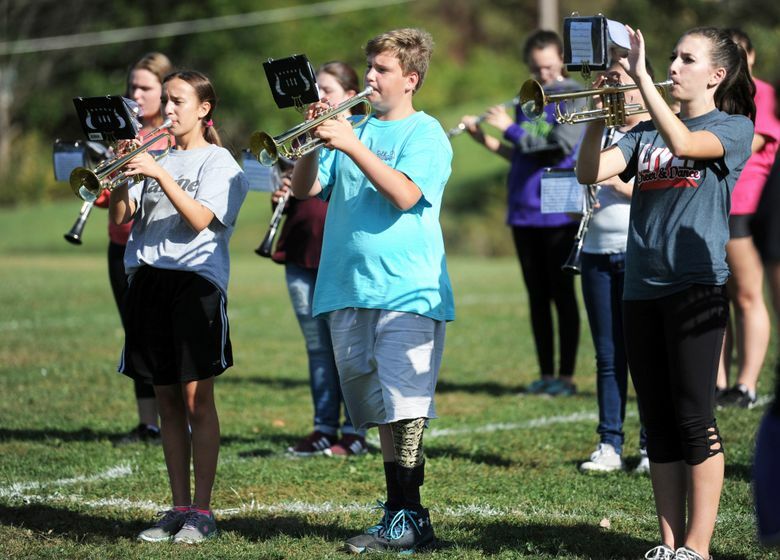 But the seventh-grade Northern Cambria Middle School student hasn’t missed a beat as a member of the Northern Cambria junior high soccer team and the Northern Cambria High School marching band. “He’s surprised us,” said his mother, Jill. Outside of school and his extracurricular activities, Braden also likes to fish, hunt and do field research with his uncle, Kurt Regester, a biology professor at Clarion University. He’s had to make special adjustments at certain amusement parks and for swimming, but he doesn’t let that stop him either. “I can’t think of one single thing we’ve encountered that he can’t do,” Jill said. Every one to two years, Braden has to undergo surgery to shave down the remaining bone in his leg, which grows into a point as he continues to grow, causing him discomfort. After each of those surgeries, he’s fitted with a new prosthetic. Braden said he’s used to putting on his prosthetic leg every day just like his other family members put on socks and shoes, but his mom says he doesn’t give himself enough credit. “Just think about putting a limb on when you get out of bed in the morning, it takes a lot of stamina,” Jill said. “If this is the only thing that sets him back in life, he’s lucky,” added his father, Bruce. Braden said he sometimes gets discouraged because he doesn’t have both of his legs, but quickly overcomes it by thinking about all the things he’s able to do. “I’m still normal, one of my legs is just metal,” he said. In the future, Braden said his goals are to just keep doing the things he loves, and he encourages others facing challenges to focus on the same. Lance Jones, music teacher and band director at Northern Cambria School District, said he’s seen Braden’s positive attitude and work ethic on display during his first band camp this summer. “He was a support system for others,” Jones said. “Braden doesn’t say ‘why me?’ ” Jill added. Braden’s journey has also empowered his parents to raise awareness about lawn mower safety and his older brother, Brock, 15, a sophomore percussionist in the band, keeps an eye out for him at practices. Jill, who was a vocational rehab counselor at the Hiram G. Andrews Center in Upper Yoder Township at the time of Braden’s injury, said she never thought that her job helping the disabled realize the potential for their future would allow her be a better parent to her younger son.